As mentioned in a previous post, recycling at Princeton district schools was stopped in the summer of 2007. Last fall, students and staff worked hard to get recycling going again. This summer, I stopped by the bins at the high school loading dock to see how things were going. The good news was that the bins were packed with recyclables. The bad news was that, three weeks later, the same recyclables were sitting in the same bins, which meant that pickups had been stopped. 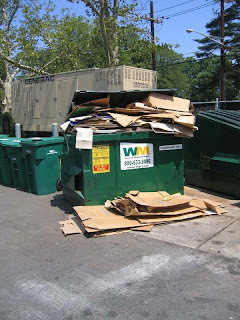 The cardboard dumpster was overflowing, and recyclables were getting thrown in the trash for lack of any other option. An email to staff brought a response. Pickups have resumed, but the recurring lesson is that any recycling program can fall apart at any time, and ongoing monitoring is needed, in-house rather than depending on interested community volunteers, to avoid lapses of this sort. The other lesson of this incident is that government monitoring of school recycling, which may occur every year or two if at all, is very unlikely to be accurate, given that recycling is so dependent on the passion and persistence of students and staff who may come and go.